I know you’ve been so accustomed to batting out algorithms with glory on the backend. Your a rockstar coder, except on the front end. One thing I’ve learned over the past few years working in leadership and stiring my own entrepreneurial effort is there aren’t enough devs focusing on the Front End. In recent interviews I’ve noticed devs are more focused on how to perform crud operations in mySQL rather than what’s the best method to validate an input. Or how to display a paginated table on mobile. Have we forgot the importance of the Front End? Its hard to think that with so many awesome frameworks like React and Angular that make front facing dev a breeze. Node has made backend programming possible for front end devs but its true the learning curves are a bit challenging. To my fellow Tech’s – I’m sure we’ve all been in the situation where we’ve passed by a co-worker at the coffee machine and gave off a smile or friendly gesture, only to be left with a blank stare and no response. “Having a bad day i see…” is usually what’s going through my head at that point but I usually pay it no nevermind and keep it pushing throughout my busy day. The fact that busy people have bad days but deal with them in different ways came even more apparent when I joined a large team as a Lead UX Developer and was coined as “too happy”. There is no way that I don’t get frustrated and want to toss my laptop out the window but I’m not the one to display that anger to the rest of my coworkers. It’s not my nature. There are times I’ve been pushed to the point I had to step out of the “too happy” and into the “fairly pissed” zone. But how do you keep your composure while networking with not so nice people? I begin to approach my situations differently. Being a female developer, I battled for years to not appear too aggressive in fear of being coined combative or angry. Nothing worse than being an angry Black woman on top of all of that and in tech if you get titled that in the minds of others, it’s a wrap. Did I stop smiling at people at work? No… being a Lead in tech, your looked up to and somewhat expected to have a sort of stance. For that fact, I smiled even more. I wanted my team to know they could rely on me, even though I was going through hell at home and no one knew it. But smiling at everyone doesn’t mean you’re happy! This statement is true and I had to understand that it wasn’t my job to piss others off because I’m pissed off. I realized it was easier to fake a smile than have my bad attitude reflect off on everyone around me, especially my team. Socially, my understanding of how workplace culture works helped me contribute to its improvement in many of the organizations I’ve worked at. I begin to initiate and participate in networking events that brought togetherness. On a social standpoint, I even begin to attend events out of office which created interest from those internally. They got to see who I was on a social standpoint and I didn’t hide it and still don’t. I’m one to believe that if you can smile your stress off, you can create a more constructive environment which ultimately changes (or doesn’t). Thus my need to network and be around others who are completely different than me became my focus early into my 20’s. It’s true, tech can be stressful at times, but it is an industry we can learn a lot socially from. Full of unique individuals with a ton of different stories. I remember I met a woman at the cafeteria in one of my old positions who said, “people who smile all the time are annoying”. I laughed and cried at the same time. In some cases, you just can’t brighten the day of someone who is already miserable, it’s impossible. Those type of people I smile at anyways. Not to be annoying, only to share that I am aware that you are pitiful and I refuse to partake in your pity party in any case. Carry on! I attended an after work social at a bar and grill and everyone was smiling. Perhaps these are the people who are just like me, who found the missing link to happiness at work and are capable of managing stress with a smile [and a drink]. If you find yourself not able to be happy when you walk into your workplace, jump out of your norm and join a new professional organization or afterwork social that will remove you out of the norm. You can’t please everyone but being friendly and networking is a mediocrity ice breaker in my book. Socially, the more you surround yourself with people who are different, the more delighted you are to find peace and substance in new situations thus making being happy everything to smile about! Wow. It finally came around. The buzz had been looming around Dev/Color for a while but “what would it be like?” I remember asking myself this when the Announcement email arrived in my Yahoo inbox. Yes, I still use yahoo mail! The day of the conference came around and I spent much of my time not just socializing but observing as well. I’ve been apart of a few other local groups and have travelled to some amazing tech companies and met some the worlds most talented contributors to the world of Web and Software. The Dev/Color annual conference proved it was more than just a meetup and very much different than what I had been apart of in the past. 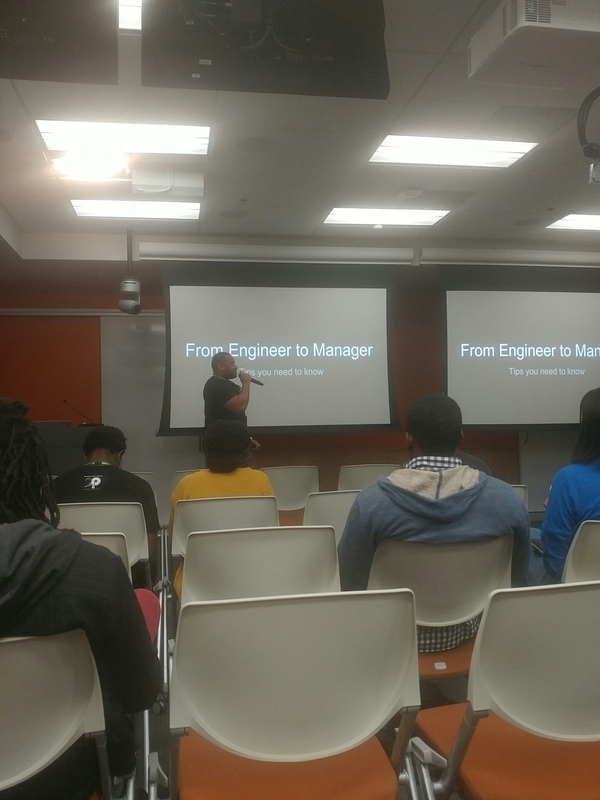 It was about 130 (give or take) or so Black Software Engineers. 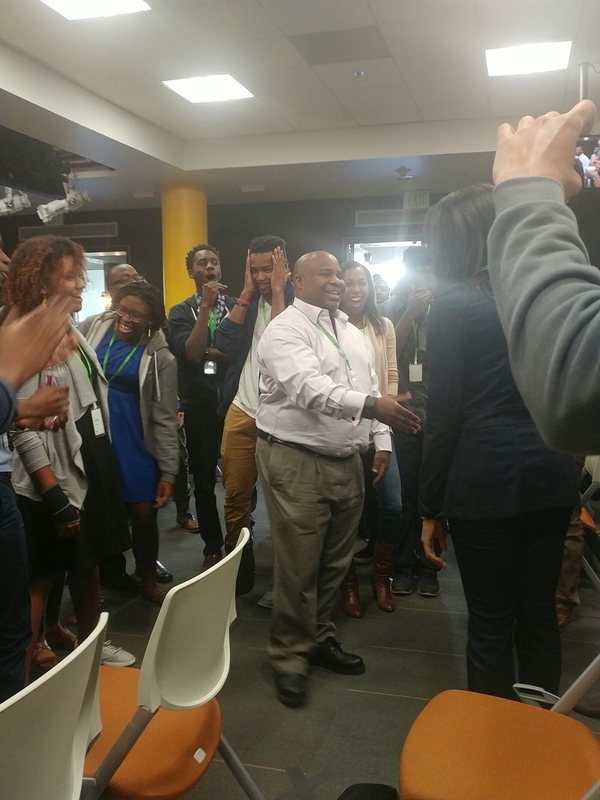 At one point during the Keynote by Founder Makinde Adeagbo, we were actually all in one room and it was monumental. 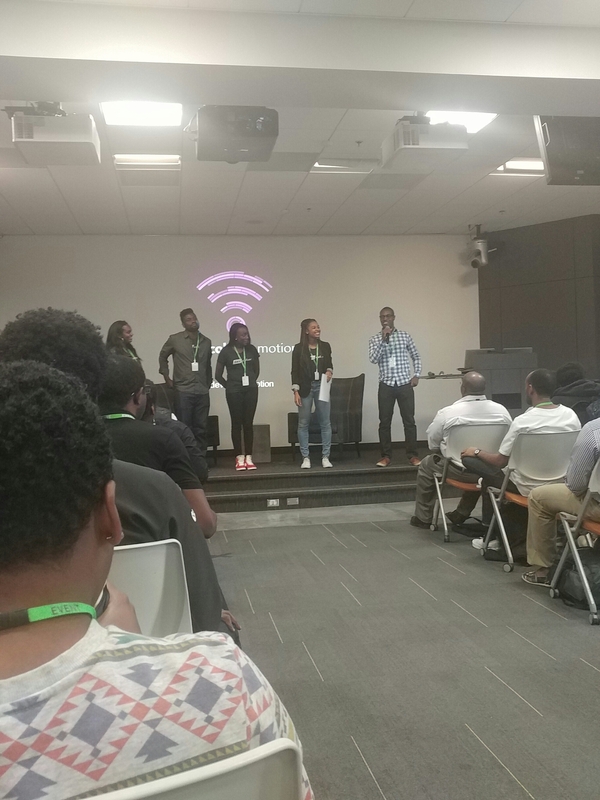 All of us Black Software engineers in one setting at Facebook HQ. Epic! “Wow!” That’s how I felt. This was the best feeling I’ve had in a while because it was my first time seeing so many of Us [black] developers in one setting, smiling, laughing, socializing, learning and being 100% comfortable around one another. It was almost as good as a family reunion in which you see many distant cousins some of whom you’ve never met or even knew you had. Seriously, the event was small but epic to say the least. Impactful information delivered by tech greats including some of our very own colleagues and tech associates. What a great feeling it was. The dev/color Team, Ariel Belgrade and her amazing crew of black professionals showed off once again. They work very well under pressure and seemed to float through the conference always bracing a smile and being nearby when needed. 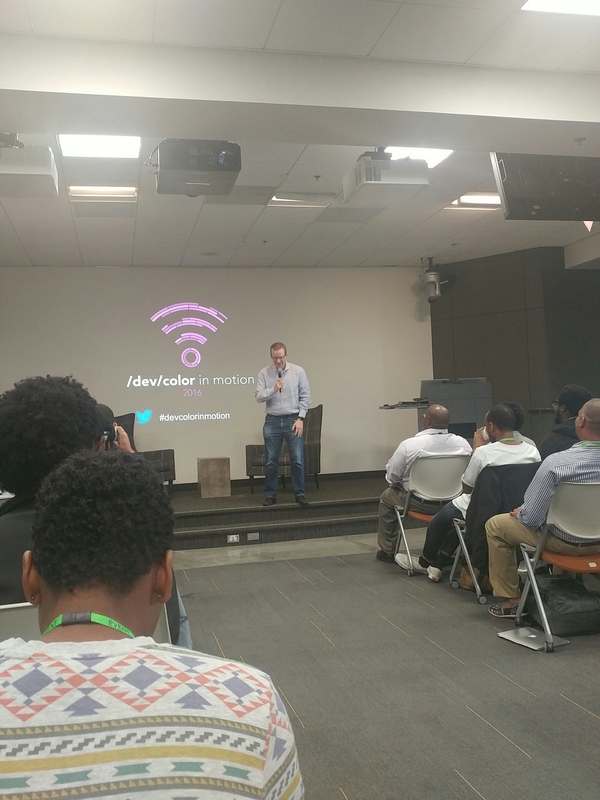 The day started out with an intro and welcome by Mike Schroepfer, Facebook’s CTO following sessions by other pros like Ben Horowitz, founder of Andressen and Horowitz and Silicon Valley VC Hugh Molotzi. The keynote speech was delivered by non-other than Dev/Color founder Makinde Adeagbo outlining the growth and span of the organization. 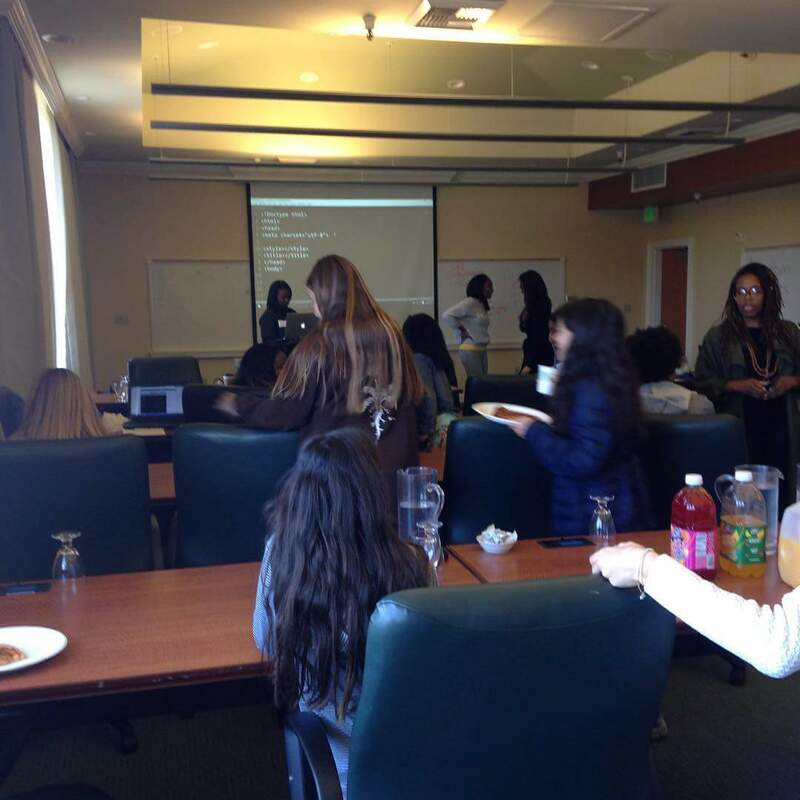 Quick talks by others including dev/color members were just as rewarding. Here are some pics with highlights of the day. Dev/Color’s Makinde Adeagbo (right) alongside Programs Director Ariel Belgrave the other amazing dev/color team members. Excited to see what next year holds for this progressive group. 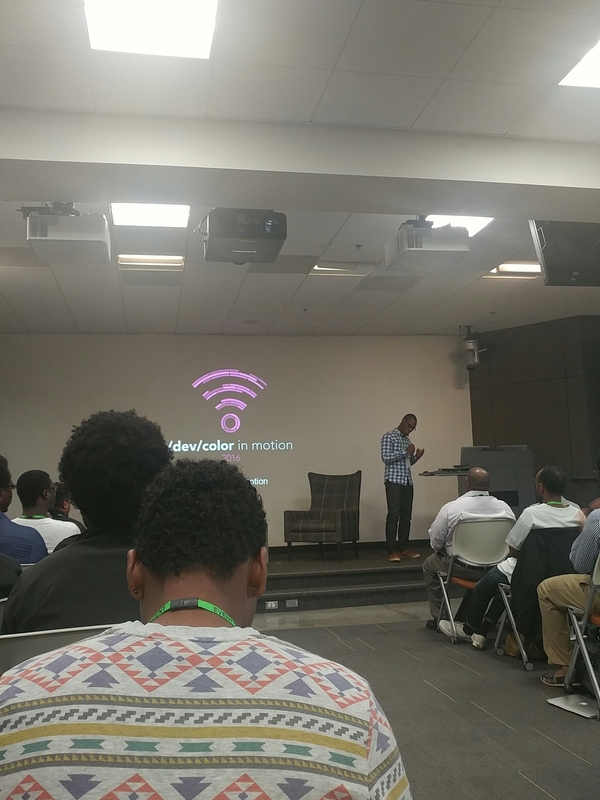 Excited for Makinde and the whole Dev/Color team bringing together Black Software engineers and helping us reach our goals by providing a network of success and resources. I’ve been to many Reggae festivals but nothing like Reggae on the River. I’ve returned as a festival goer this year and this time as a camper. In previous years I was at the festival on behalf of the artists. With all the great vibes that go on behind the stage/scenes, I knew the ‘festival goer’ experience had to be just as pleasant. Honestly, pleasant is an understatement. Reggae on the River, in its 32nd year of irie vibes, is one to enjoy and one me and my hubby will put on our calendar to prepare for every year. Can’t load the video? click here. The event was cool… I walked a good 20 blocks from Bart to get there but once I got in the GitHub HQ doors, I realized my walk was well worth it. I could probably walk another 20 for that experience and what I got from the Dev/Color Tech Talk that night. We met at about 6:30pm. I was late and arrived at 7:00pm. The bar and began tacos were calling me from a distance. 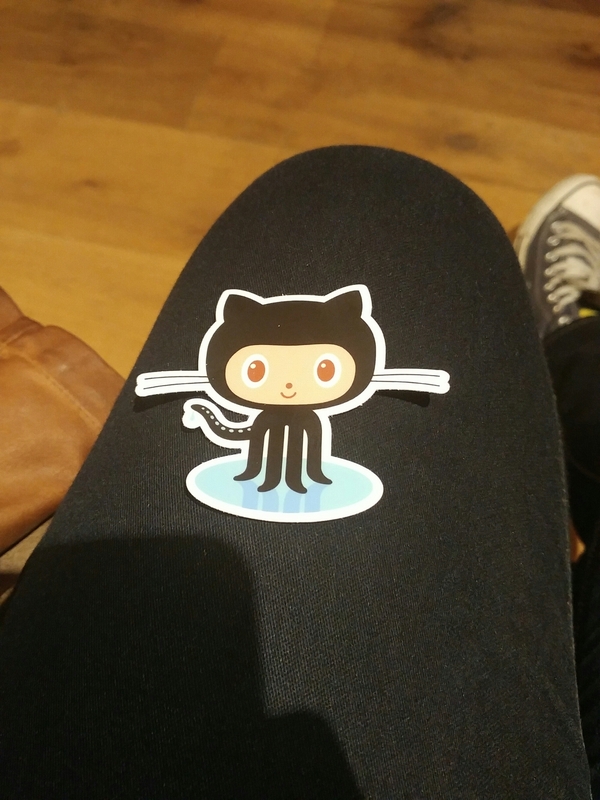 I met my team members at the large picnic tables in the center of GitHub’s lounge. After a glass of wine and a few veggie tacos it was on to the board room (very unconventional by the way). 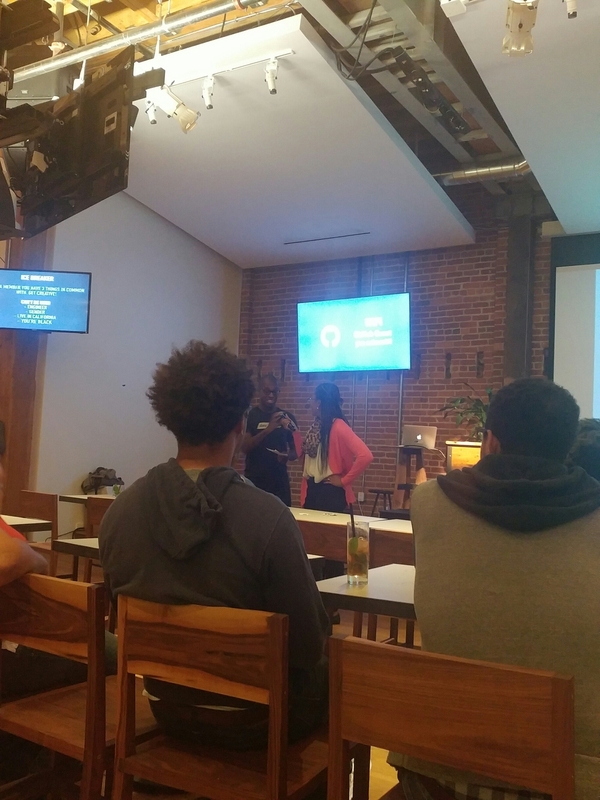 A couple of GitHubs software engineers talked about their experiences working at a tech company. They went in and spoke about being in leadership while being black and minority, the challenges and rewards. I enjoyed GitHubs team very much but The real kicker for me was the intro to Hack Programming language and the statistical subjects a couple of our dev color members brought up during their 15 minute lightening talk. I won’t go into the talks but I will tell you they are beneficial and enlightening. Overall, my view of start up culture is changing. I’m viewing tech as a race that few are embracing. Even few African Americans. Why is it? Ill dig in another post but keep posted here for more updates on my tech journey. s tag and sentences will be happy too! I’m just saying. I hope to work with this group again… they left fed and aggressive to build their own apps, games and websites. Always encouraged to be involved in any community event involving schooling our youth. I ended my day back in my tiki here in the East Bay. Do something good and pass the knowledge down to this brilliant generation. Am I the only one or is anyone else in love with the Nigerian “Finn” aka FN-2187 played by John Boyega? Am I the only one or is anyone else in love with “Finn” aka FN-2187 played by John Boyega? Fans are screaming for this young (23 years old) British actor, son of Nigerian immigrants and now the centerpiece in the new Star Wars: The Force Awakens flick. Nigeria is falling in love with Star Wars. There are two reasons. There’s a growing nerd culture in the country — young people who love science fiction and see it as a way to imagine our own futures as something better than our present. We also have an annual Comic Con in Lagos. And last year a friend and I started an online “speculative fiction” magazine, Omenana.com, which has helped promote a new generation of sci-fi writers and artists. The other reason: John Boyega. Boyega is the son of Nigerians who settled in Britain. He plays Finn, a disillusioned Stormtrooper in the new movie Star Wars: The Force Awakens. And he’s proud of his heritage. “I’m grounded in who I am and I am a confident black man, a confident, Nigerian, black, chocolate man,” he has posted on Instagram. Nigerians are already familiar with Boyega. He was in the U.K. sci-fi flick Attack the Block and played Ugwu the houseboy in the film adaptation of Chimamanda Adichie’s novel Half of a Yellow Sun. But seeing him in Star Wars has been another kind of experience. Kemi Williams has been a Star Wars fan since she saw the first film when she was 12. Now she’s 50 — and gratified that there were more relatable characters in the franchise for her children than there were for her. Williams was happy that the new Star Wars film has a more diverse cast. She was especially impressed by Boyega’s reaction to racist remarks about his casting. Williams was one of several moviegoers I interviewed in Abuja, Nigeria’s capital. Boyega’s heritage is of less interest to younger Nigerian fans. Chiagoziem Okoronkwo, 30 and a personal trainer, notes that a number of actors of Nigerian heritage, such asChiwetel Ejiofor, Carmen Ejogo, David Oyelowo and Megalyn Echikunwoke, have risen to prominence in the past few years. But he’s still excited about the character Boyega plays, which doesn’t fall into familiar Hollywood stereotypes of black people. Ultimately, most moviegoers I spoke to agreed that Boyega’s turn in the movie was most effective as a way to win new fans to the franchise in Nigeria — even if they didn’t realize at first that he was of Nigerian heritage. Awufeso, who had never been interested in the Star Wars franchise before the premiere of the film, went to see the movie only after previous plans fell through. He was won over by the film — and Boyega’s performance. For an older fan like Kemi Williams, the true benefit of Boyega’s casting is that it will bring in a wider audience in Nigeria and show them how science fiction can change the way people think. While developing a fairly data centric Hybrid Application using Cordova, I had a need to exclude AJAX from my form post and send my post request as a standard HTML form post. My main reason for choosing this way over ajax was that I was posting files as well as a long base-64 uri to a C# script on my server. I had a simple aspx form on the servers receiving end that needed to capture the post values coming from the client-side app. I chose this route because users of our applications are in rural areas where their signal strength on their devices we’re so strong. Sending images and base-64 data can be a large pay-load not to mention the other 206 fields coming from the app. In the end, I wanted to mimic a ajax post while using Formdata which kept me from having to manually create the data object. I wanted the form to post to a new window but in Cordova, the UIWebView takes over and replaces Safari web browser with their view. Below is a code snippet found at StackOverflow that did it for me… I modified my version a bit more to define my parameters but for the most-part this same code snippet got my form to post to an external link on our server. Clean and build your application in both CLI then in XCode and test. I ran through a lot of examples of how to post from Cordova to an external form but nothing actually worked. Seem’s this way the best fix for my time and effort. The result was simple enough. Take this post for whatever you may see it fit for but when I say ‘If your site is not responsive, neither are you!’, I really mean it. As I am writing this post today is December 19, 2015. 6 days away from Christmas and you should already know, me being the shop-a-holic and tech nerdy… I’ve been online shopping like never before. Not only have I beefed up my purchasing over the last 19 days, I’ve navigated to hundreds of sites for information, guidance or commentary relevant to my overall xmas plans, travel and shopping. My blunt and obvious comment is based off of my repetitous experiences with non-responsive sites over the web at this time in the year. Wouldn’t a merchant who sells products online expect that mobile users may navigate to their site quicker than someone on a desktop? Mostly all of my shooping this year was done online and I can’t tell you how frustrating it is to not be able to use a website that doesnt fit my screen. Between scrolling left to right and tapping on buttons I did’t mean to, I found myself paying more at places like Amazon or Target Online just for a better user experience. Any of my readers reading this, make sure if you encounter a website online that is not responsive, contact support at the organization and request they format their site to show up correct on mobile. Explain this would make you want to come to the site more active. Though this is a nice gesture of kindly throwing it out there, the truth is the site owner most likely doesn’t care if they aren’t in the process. Make it know its needed and don’t use their site altogether.